A981 This sampler kit contains eight different self-tapping and threadforming screws in eight 25-count vials. 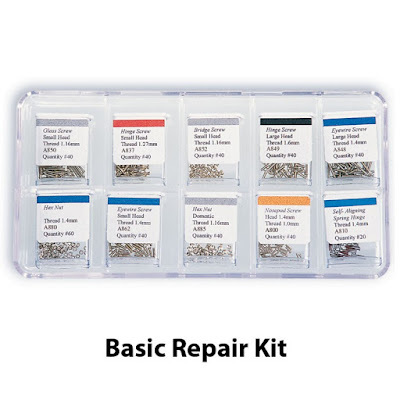 All 200 screws in this handy kit are made from stainless steel and have coated threads. Thread sizes are 1.2mm to 1.6mm. Screws are self-tapping, selfaligning spring hinge, and general repair styles. A983 If you have only one repair kit, make it this one. With 400 pieces in ten individual screw and nut vials, the contents can replace nearly all screws.Thread size range from 1.00mm to1.4mm. Styles include glass, hinge, bridge, eyewire, nosepad, self-aligning spring hinge, and hex nut in small and large heads. A984 The essential rimless repair kit contains all of the parts which are necessary for the assembly or repair of rimless frames. Each kit contains over 600 pieces including gold and silver glass screws, hex nuts and nut caps, metal washers and two sizes of plastic bushings.